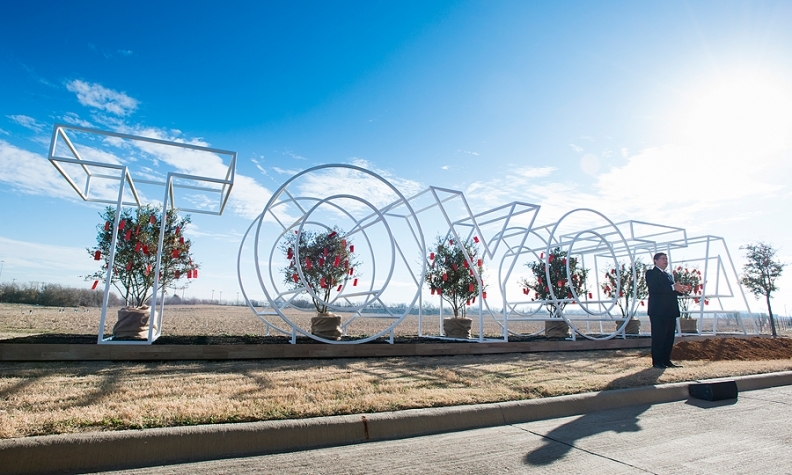 Toyota North America CEO Jim Lentz speaks in front of a Toyota sign at the groundbreaking of the automaker's new North American headquarters in Texas in January. TOKYO -- Japanese automakers delivered record contributions to the U.S. economy last year, both in the number of people they employ and in work-force compensation. The trend is driven by booming sales, ramped-up U.S. production and higher exports from North America. The economic-impact figures, presented in a study commissioned by the Japan Automobile Manufacturers Association, show that businesses tied to Japanese brands added some 157,000 jobs to the U.S. economy in 2014. Workers on the retail side -- dealers and supporting businesses -- saw bigger percentage gains in employment and compensation than their counterparts in manufacturing, the data show. But both segments enjoyed healthy increases. The study, conducted by Thomas Prusa, an economist at Rutgers University, highlights the growing impact of rising production, sales and exports by Japanese automakers in the U.S.
Japanese-brand exports from the U.S. reached a record 472,000 vehicles in 2014. Japanese carmakers also bought a record level of U.S.-made auto components last year, JAMA said. Job and compensation growth in businesses tied to Japanese brands outpaced corresponding metrics for the overall U.S. economy, Prusa said in a phone interview. "It's growing faster than other manufacturing sectors," he said. In manufacturing, the number of people in direct-employment jobs -- those working for automakers -- rose 10 percent to 91,122. The number of intermediate employees -- those working for suppliers -- rose 8 percent to 242,000 people. The number of spin-off workers rose 8.7 percent to 427,000. Those are individuals who do any job, from insurance sales to restaurant work, that would be lost if the Japanese manufacturing vanished. The retail side directly employs a much larger group. Direct employment in dealerships surged 15 percent to 366,590 people, while intermediate employment advanced 14 percent to 119,000. Spin-off workers expanded 15 percent to 275,000. Dealership employees saw the bigger jump in compensation per person, surpassing their factory counterparts. Average compensation on the retail side rose to $70,303 in 2014, from $59,268 the year before, Prusa said. On the factory side, it edged up to $68,645 last year from $65,483. The retail results include dealerships that sell Japanese brands in addition to non-Japanese competitors. The study did not examine the impact that the Detroit 3 or European automakers have on the U.S. economy.